· Basic graphics user interface implemented with 2D shapes and graphics. 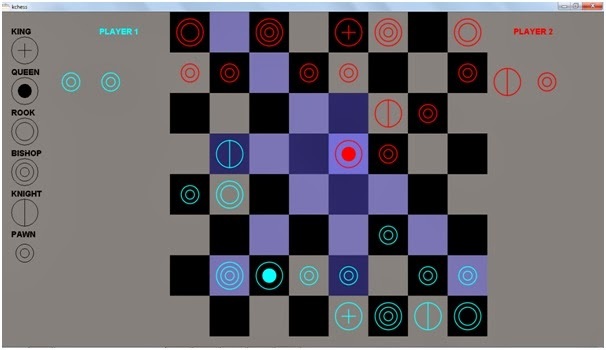 · Almost similar to chess game present in windows. · When a chess piece is clicked all possible moves of former is highlighted with blue squares. · Have the feature of pawn promotion. Starting point of the program.Ensures data in program are initialized only once. Creates new Jframe and embeds an instance of kchess in it. Kchess class defines the complete game. Holds the x-coordinate of the place where the mouse is clicked. Holds the y-coordinate of the place where the mouse is clicked. Index represents the position and values inside it represent wether chess piece is present or not. Holds all possible moves if chess piece is clicked. Sets the background and foegroung color. Initializes array x and y. Draws all the red chess pieces. Draws all the white chess pieces. Sets the value to 999. Returns true if square is in the possible moves of the selectd chess piece. Draws the descriptive representation of chess pieces on left side of the window. Draws knight at kth position square. Draws pawn at kth position square. Draws king at kth position square. Draws queen at kth position square. Draws rook at kth position square. If chess piece is present at the kth square then it changes the color of all possible moves of the chess piece to blue. Sets the value of array f according to all possible moves of selected white pawn. Sets the value of array f according to all possible moves of selected white rook. Sets the value of array f according to all possible moves of selected white king. Sets the value of array f according to all possible moves of selected white bishop. Sets the value of array f according to all possible moves of selected white queen. Sets the value of array f according to all possible moves of selected white knight. Draws and fill the squares. Sets the value of array f according to all possible moves of selected red pawn. Sets the value of array f according to all possible moves of selected red rook. Sets the value of array f according to all possible moves of selected red king. Sets the value of array f according to all possible moves of selected red bishop. Sets the value of array f according to all possible moves of selected red queen. Sets the value of array f according to all possible moves of selected red knight. Draws the 8X8 chess board. Calls intro() method to draw chess pieces description. Called through repaint() when event(mouse click) occurs. 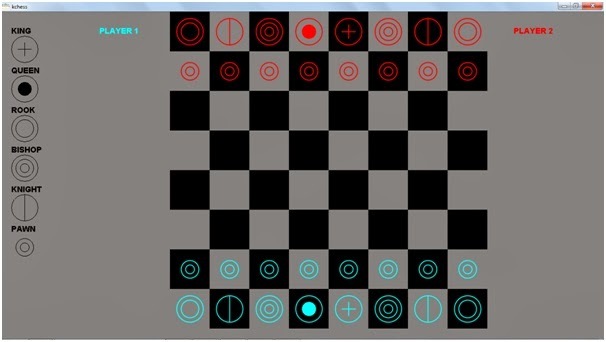 If chess piece clicked-all possible moves are shown through blue squares. If blue square is clicked-the selected chess piece moves to the desired position. The complete references JAVA by Herbert Schildt .